Every day, millions of school age children ride a bus to and from school. Knowing the rules of safety helps to ensure that their trip to and from school is a safe and enjoyable part of every school day. Hold the handrail when getting into the school bus. 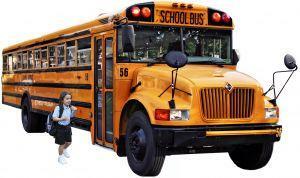 Stay in your seat until the bus comes to a complete stop at the school or at your bus stop on the trip home. Walk to the front of the bus and use the handrail while stepping off of the bus. Do not get off the bus at a bus stop other then your designated stop. Once you get off of the school bus, go straight home. Do not talk to strangers on the way. If you leave something on the bus and have already walked away from the door, do not go back for it. The bus driver may not see you coming back and may start driving away. If you have to cross the street after exiting the bus, always cross in front of it. Make sure the bus driver is able to see you. Walk along the side of the road at least 10 feet in front of the bus until you can see the bus driver, before crossing the street. If you cannot see the bus driver, the driver is not able to see you. Wait for the bus driver to give you a signal that it is safe to cross the street. Even with the signal from the bus driver pay attention to the traffic in the road. Make sure to look in both directions before walking across the street. Never go near the back wheels of a school bus.